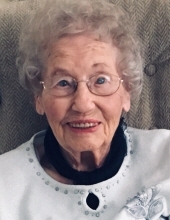 Susie Lodemia Spezia, 97, of Atlanta, GA, formerly of Herrin, IL, died on March 27, 2019. Susie was born on September 13, 1921 to Harry L. Mifflin and Electia Prather Mifflin of Pittsburg, IL. She married Mike L. Spezia of Herrin, IL, on February 18, 1950. Survivors include a son, Michael Spezia (Sandy) of Pittsburg, IL; daughter, Melissa Spezia Faulkner (Greg Kiburz) of Atlanta, GA; grandson, Jason Spezia of Pittsburg, IL and two great-grandchildren. She was preceded in death by her parents, husband and four brothers, Gordon Mifflin, Jerald Mifflin, Ralph Donald Mifflin and Charles Mifflin. Mrs. Spezia worked for many years at Pisoni Insurance and Realty Company in Herrin, IL, and was a member of Our Lady of Mount Carmel Catholic Church. She regularly volunteered for Herrinfesta activities over the years. She enjoyed sewing and cooking for her family and friends. Rite of Christian Burial will be 11:00 a.m. Wednesday, April 3, 2019 at Our Lady of Mt. Carmel Catholic Church in Herrin with Msgr. Ken Schaefer officiating. Interment will be at San Carlo Catholic Cemetery in Herrin, IL. Visitation will be 9:00 a.m. – 11:00 a.m. Wednesday in the gathering space of the church. Memorial donations may be made to Our Lady of Mount Carmel Catholic Church or OLMC New School Fund, 316 W. Monroe St., Herrin, IL 62948. To send flowers or a remembrance gift to the family of Susie L. Spezia, please visit our Tribute Store. "Email Address" would like to share the life celebration of Susie L. Spezia. Click on the "link" to go to share a favorite memory or leave a condolence message for the family.